The subtitle is: “A biblical, historical, and theological investigation.” This book was published by Wipf and Stock Publishers, Eugene, OR in 1999 but was originally published by Zondervan. It contains 12 chapters by 7 authors substantiating Sunday as the proper day for believers to worship. It answers the most recent writers who advocate either a Saturday Sabbath or Sunday as a Christian Sabbath (which this book admits is an oxymoron). Carson, in his introduction, writes, “Without doubt, the work that has stirred up most interest in the subject, at least in the English-speaking world, is that of Samuele Bacchiocchi” (From Sabbath to Sunday: A Historical Investigation of the Rise of Sunday Observance in Early Christianity). Bacchiocchi is a Seventh Day Adventist who published his book with the Pontifical Gregorian University in Rome. 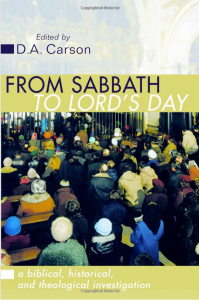 Carson, A.T. Lincoln, R.J. Bauckham, and others take the reader deep into linguistics, history, and exegesis to answer the most common questions regarding why we still hold to Sunday as our day to worship, and why we do not keep the Sabbath nor make Sunday a Sabbath. Very good and helpful.